There’s only one thing better than hanging out with a puppy—hanging out with over a dozen puppies, at once. Imagine all the puppy kisses, cuddles, and cute little tail wags! 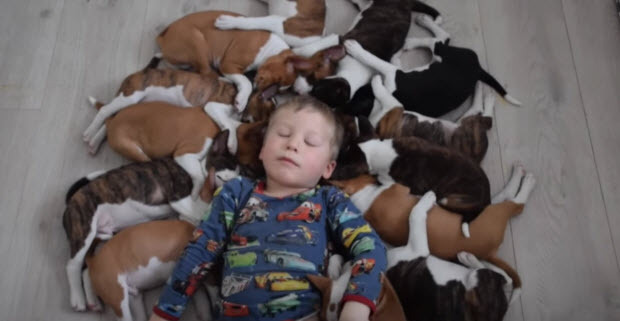 While you may have to go to your local dog park to experience such a huge puppy party, check out this video to meet a family full of puppy love. In this video, one family of breeders shows off their family of Basenjis. Tumbling through the snow and running through the house, these cute little puppies are just what the doctor ordered—just watching all these dogs will make you melt. This family of puppies is owned and co-owned by the Kennel Kingwanas Basenji Breeders. 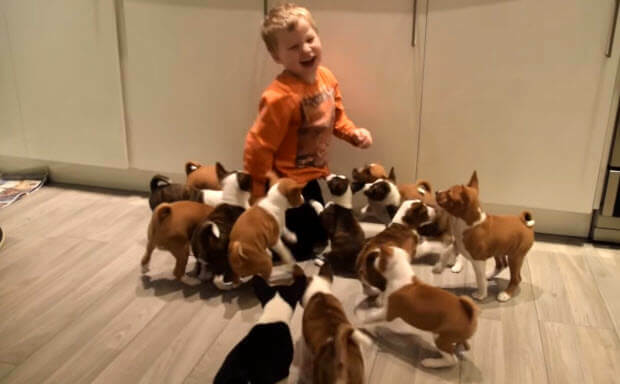 Breeders Liv and Dag shot this amazing video of all of their Basenjis having fun with their two sons. From running and playing around the house to piling into the bed for the night, these Basenjis are just the cutest. Having been in the breeding business since 1998, this family isn’t complete without a few, or 16, Basenji’s running around. Liv actually began breeding Basenjis when she was just 16 years old, having received her first puppy only two years before. Fast forward several years and you have over a dozen puppies with more cuteness than you could possibly handle! This Dog Behaves Like A Small Kids And It Is Hilarious And Adorable!